Improving soil and water management may assist in lifting potato yields, Plant and Food Research trials show. Growers are achieving yields of about 50 tonnes a hectare in the field, compared with a potential yield of 80 to 90 tonne/ha. 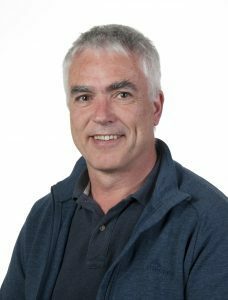 A Plant and Food Research project tested three possible reasons for this in terms of soil and water management, according to PFR environmental quality team leader, Dr Steve Thomas, from Lincoln. 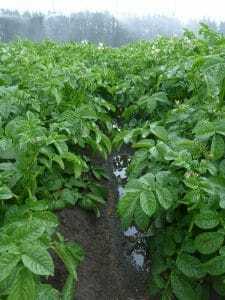 The reasons being; that water is a key limiting factor for closing the yield gap of potatoes, that management practices alter soil water capture and storage, and that seasonal changes of soil physical parameters affect water use over time. “Most potato growing is now done with some type of irrigation and the project is looking at ways that can utilise more water stored in the soil, while avoiding losses of the irrigation water,” said Dr Thomas. Potatoes are easily water stressed and can quickly lose production as a consequence. Potato rooting systems are relatively small compared to other crops, limiting their ability to extract water from deeper soil layers. Research looked at which type of planting bed, whether a flatbed or the traditional ridge and furrow, captured more water and reduced water losses through evaporation. 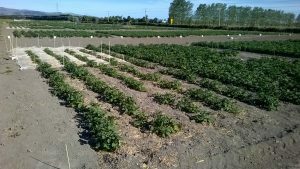 To maximise the value of irrigation and improve moisture retention, wheat straw mulch on a potato crop was also trialled. The mulch was applied to the surface of a flatbed potato crop and compared with a no-mulch trial plot. Under a traditional ridged potato crop there is not a lot of water held in the ridges “and that is where the potatoes are. The ridges are also difficult to wet up, particularly under irrigation. You pour water on to the canopy at a high rate, which largely distributes it into the furrows, bypassing the soil in the ridges,” said Dr Thomas. In the 2015-16 season, an experiment was run on a PFR experimental block using two different bed shapes (ridge/furrow and flatbed) and two irrigation regimes (full irrigation, which was irrigated twice weekly to replace soil water deficit and low irrigation which was irrigated when soil water deficit in the top 400mm of soil was close to wilting point). This showed a yield increase (seven tonne/ha) in the flatbed plots compared with the ridge/furrow plots under full irrigation. Bed architecture also had an effect on soil water properties, with the potatoes in the flatbed achieving better water uptake. “This gives us confidence that we should be exploring this further,” said Dr Thomas. Looking at the effect of mulch on soil water capacity, it was found that higher water contents were found under mulch. 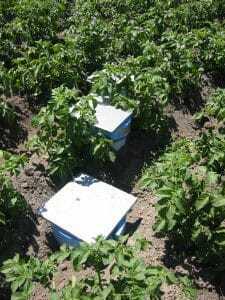 The greatest effect was when the crop canopy was small, at the early growth stages. Yields were higher from flatbeds, compared with ridge/furrow and the highest yields were from mulched plots. This showed that bed architecture affects soil water properties and that mulch maintained higher average soil water content. Opportunities for reducing losses with irrigation included reducing excess drainage. A research project looked at different irrigation and nitrogen application rates in terms of how best to manage water and nitrogen and to avoid excess drainage and nutrient loss. Growers should use irrigation scheduling and water balance type tools such as crop or soil moisture sensing and allow soil moisture deficits to build where possible. Another trial looked at reducing nitrous oxide emissions from crops. The trial used three different rates of nitrogen application, zero, 225 and 450kg N/ha applied in the potato ridges, and measured emissions from the fertilised ridges, uncompacted furrows and wheel-compacted furrows. This showed that the biggest drivers for nitrous oxide emissions were compaction, excess soil nutrients and excess irrigation. Uncompacted soils produced the least nitrous oxide. “All of these things can be avoided by being more efficient in terms of nutrients and water,” said Dr Thomas.